Western blot analysis of exracts from LN18, HT-29, and U-2 OS cells using α-Adducin (D7T7R) Rabbit mAb. Immunoprecipitation of α-adducin from U-2 OS cell extracts. Lane 1 is 10% input, lane 2 is Rabbit (DA1E) mAb IgG XP® Isotype Control #3900, and lane 3 is α-Adducin (D7T7R) Rabbit mAb. 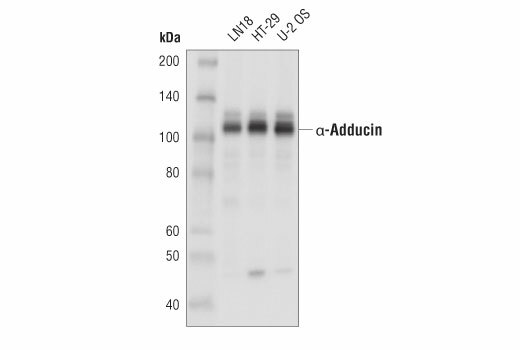 Western blot analysis was performed using α-Adducin (D7T7R) Rabbit mAb. 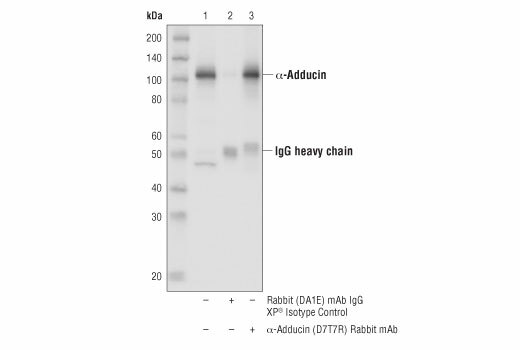 α-Adducin (D7T7R) Rabbit mAb recognizes endogenous levels of total α-adducin protein. Monoclonal antibody is produced by immunizing animals with a synthetic peptide corresponding to residues surrounding Asp643 of human α-adducin protein. The adducins (ADD) are cytoskeleton-associated proteins that help cap the ends of actin filaments, promote association between spectrin and actin, and participate in synapse assembly. The three closely related genes ADD1, ADD2, and ADD3 encode the α-adducin, β-adducin, and γ-adducin proteins (1). Research studies indicate that β-adducin is found at high levels in brain and hematopoietic tissues, whereas both α-adducin and γ-adducin are ubiquitously expressed (2). Adducin protein function is regulated by phosphorylation at a number of sites. Both PKA and PKC can phosphorylate α-adducin at Ser726 and β-adducin at Ser713, which inhibits calmodulin binding and adducin activity (3-5). Additionally, PKA (but not PKC) can phosphorylate β-adducin at Ser408, Ser436, and Ser481, which negatively affects spectrin-actin interactions (3). Phosphorylation of α-adducin at Thr445 and Thr480 by Rho-kinase regulates cell motility and membrane ruffling (6). Finally, CDK-1 phosphorylation of α-adducin at Ser12 and Ser355 during mitosis leads to association of α-adducin with the mitotic spindle, suggesting that α-adducin may play a role in mitotic regulation (7). Because α-adducin plays a role in regulating renal sodium reabsorption, it is not surprising that a number of studies show a relationship between ADD1 genetic polymorphisms and the development of hypertension (8-10). Matsuoka, Y. et al. (2000) Cell Mol Life Sci 57, 884-95. Joshi, R. et al. (1991) J Cell Biol 115, 665-75. Matsuoka, Y. et al. (1996) J Biol Chem 271, 25157-66. Chen, C.L. et al. (2007) J Cell Sci 120, 1157-67. Naydenov, N.G. and Ivanov, A.I. (2010) Mol Biol Cell 21, 3506-17. Fukata, Y. et al. (1999) J Cell Biol 145, 347-61. Chan, P.C. et al. (2014) J Cell Biol 204, 19-28. Kalita, J. et al. (2013) Neurol Res 35, 429-34. Kundu, A. and Anand, A. (2013) Cell Biochem Biophys 65, 13-9. Watanabe, Y. et al. (2010) Hypertens Res 33, 129-34.